Reworking or remixing opera classics is one of the hot current trends in American opera circles. Skylark Opera Theatre’s production of The Tragedy of Carmen certainly caught local opera fans’ attention with a heavily streamlined, 90-minute version of the classic opera by Bizet, with packed houses and fans clamoring to see this up-close-and-personal treatment. Transforming an opera in this fashion is more than a matter of rushing tempos and trimming dead space: in most operas, this requires significant rearrangements to the score and changes to the libretto, with choruses, duets, and even arias on the cutting room floor. These changes open the door to reworking classics to try and make them more interesting or relevant to modern audiences, recapturing their resonance with the opera’s original audience. To some, editing an opera in this fashion is disrespectful to the composer. The practice, however, is actually rooted in historical practice; Verdi and Donizetti regularly revised old works to try and keep pace with changing fashions and local tastes, with whole scenes and arias sometimes on the cutting block. Even the short-lived Mozart revised his operas based on the context – in Don Giovanni, for example, Don Ottavio’s “Dalla sua pace” and “Il mio tesoro” are alternate arias for the same occasion in the moment (while both are beautiful, doing both is generally excessive). Traveling productions often ran afoul of provincial censors demanding changes – some of which were highly specific as to the maximum duration when using their theatre. Across the country, Boston Opera Collaborative – an unusual opera company in which all singers also participate in creative and administrative work – is staging a new “remix” of Giacomo Puccini’s La Rondine, an opera that Skylark audiences know from two years past. The Arts Reader‘s Basil Considine spoke with Patricia-Maria Weinmann, the Co-Artistic Director of Boston Opera Collaborative, about updating this rarely performed gem. Excluding the two operas that Puccini wrote in his twenties, La Rondine is probably the least-performed of his operatic works. What drew you to this one? 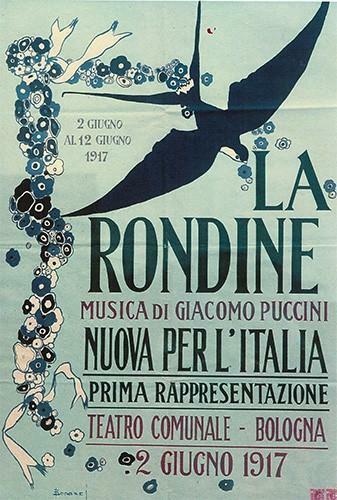 A 1917 poster for La Rondine (“The Swallow”). The rarity was one of the draws. La Rondine is not done enough and the music is some of the loveliest that Puccini wrote. It’s also a beautiful synthesis of musical styles. Our good friend, the eminent composer and conductor John Greer, noted that La Rondine has all the challenges of opera and operetta. Acts 1 and 2 are, in turn, playfully conversational and dreamily romantic. Act 3 possesses more of the serious verismo that we have come to expect from Puccini. This production is advertised as La Rondine: Remix. Is this a new arrangement of the opera? A pre-existing version by a specific creator or creative team? I was also drawn to the opportunity to re-tell the story while keeping the music and the libretto intact, albeit with some cuts. As far as I know, this is the only arrangement of La Rondine of this kind. I’ve always been drawn to the music [of this opera] and in Acts 1 and 2—charming, romantic, witty. However, the story troubled me. The libretto has been criticized as inconsequential and lacking drama. Fair enough…which brings us to the “remix”. Instead of manipulating a young man to live out her fantasy of true love, we imagine Magda asking the question, “What if…. ?” As she envisions her “What if…?”, we [the audience] accompany her on a wildly romantic – but ultimately unsustainable – dream. And as we experience that journey, perhaps we too might take a moment to consider our own, “What if’s…?”—those we have lived or perhaps those we have only dreamed. The remix consists of creating a dream sequence which begins near the end of Act 1 and continues throughout Act 3, when Magda’s dream ends and she finds herself back in her elegant Parisian home – realizing that her dream of love will probably always be just that. As she considered her “What if…”, she is filled with bittersweet regret and resignation that it is not to be. She chooses not to pursue her “What if…” because it would certainly create grief for the young man in question. Different “remixes” and “reimaginings” of classic operas have taken different tacts, sometimes including the addition of substantial new music (although generally derived from the original score) on top of libretto changes. Is this dream sequence a rearrangement/resetting of Puccini’s music with new text or something musically new? An application of stage effects to transform perceptions of existing material? There is no new libretto or new music. With lighting and staging, it will become obvious [to the audience] that Magda is imaging the cafe and seaside villa scene. Because this is her vision, the (cut) conversation with Rambaldo is unnecessary. As she follows the vision further, she realizes that she can never be with someone innocent and “untouched” as Ruggero and that she must remain in the lifestyle she has chosen: being kept by a wealthy man, secure and pampered…but without true love. We do use the waltz music near the end of Act 1 and segue to the waltz music in Act 2. It is fairly seamless and give us time for the set changes (created by the trio of friends who become something of “fairy godmothers” assisting in Magda’s dreamy vision of Magda’s. Our remix ends with the end of the actual [i.e., original] Act 1. The only change is that Magda’s line “Who will recognize me?” is cut. All [of that] music is intact and no new music or text is interpolated. This production is set in 1950s Paris, a period of massive (re)construction coupled with growing domestic unrest over the Algerian and Indochina wars. Is there anything about this specific setting that resonates with the opera? This opera does not lend itself easily to political context. This is a deeply intimate story, a personal journey that does not have geopolitical or economic overtones. Since you didn’t chose 1950s Paris because of the political-social tensions of the time, why this specific setting? Is there a specific imagery, sense of romance, etc being tapped? Why this setting in particular? 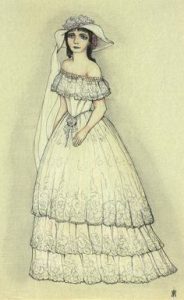 The original setting of La Rondine, as can be seen in this costume sketch of the world premiere, was consciously evocative of the 19th century, which wartime audiences viewed with nostalgia. Simple economic forces at work here. That era is easily pulled from vintage stores and many of the styles are available today via inexpensive websites online. The costume designer was also able to pull from stock. It’s an elegant era with beautiful lines for women. Personally, I also love the look. The 19th century doesn’t interest me visually – it’s as simple as that. Going from a full-length opera to 90 minutes necessarily means a lot of cutting. What’s been left behind and what’s been accentuated? The running time of a full production is just under 2 hours; it’s a short opera. The only cuts we made are sections of chorus and a scene in Act 2 in which Rambaldo, Magda’s “protector” arrives at the cafe and a difficult conversation between the two of them ensues. What is the instrumental ensemble being used for this production? 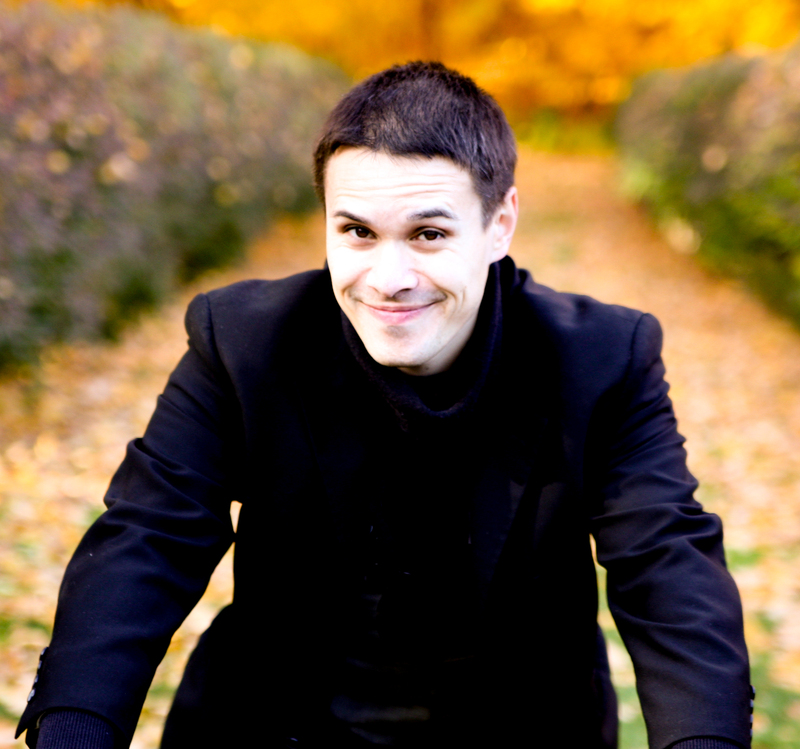 Mathieu D’Ordine, a gifted young arranger (he arranged our Faust et Marguerite and Idomeneo) has arranged the piece for piano and string quartet. We are thrilled to have the Glenside Quartet joining music director and pianist Brendon Shapiro [for the pit ensemble]. La Rondine runs through May 21 at Central Square Theater in Cambridge, MA.